Property 8: Cozy, garden solarium, sea amazing views, air cond., washer- Lucca Pisa. Property 11: Tuscany Viareggio seaside. Discover Tuscany! 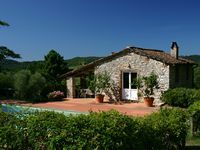 Property 14: Lovely detached house with private swimming pool, near Lucca. Property 17: Your cottage with private pool! Property 18: Beautiful vacation house with a 250 m) garden. Property 34: Nice holiday apartment with large garden, not far from the sea. Property 37: Cosy village house with a nice terrace offering beautiful views of the valley.